Editor's Note: Actor Rainn Wilson plays paper salesman Dwight Schrute in the television comedy "The Office." 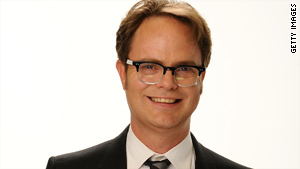 (CNN) -- Why is Rainn Wilson, "Dwight" on "The Office," writing a news commentary for CNN? Good question. It's a bit strange for me, to say the least; a comic character actor best known for playing weirdos with bad haircuts getting all serious to talk about the persecution of the fellow members of his religious faith.